Construction of this massive vessel, later named “The Queen Mary,” began in 1930 in Clydebank, Scotland. It’s maiden voyage began on May 27,1936, leaving from Southampton, England. For the first 3 years it was used as a luxury liner, playing host to many high society guests such as Bob Hope, Clark Gable, the Duke and Duchess of Windsor and Winston Churchill. For nearly 8 years the ship was used by the military for transporting troops to battle. She was re-painted grey and all the luxury amenities were removed to accommodate its passengers for a new mission. It was large enough to hold 16,000 troops and crew members and traveled at an impressive speed of 30 knots. The Queen Mary set sail across the Atlantic once again as a luxury liner starting on July 21, 1947 after its 10 month restoration process and continued its journey’s until it was docked at its final resting spot in Long Beach, CA, 22 plus years later on December 9, 1969. Air travel began to be the easier and faster way to travel, causing a decrease in the need for the number of luxury ships. She is now used as a floating hotel, an attraction and an event and wedding venue and is home to 3 world-class restaurants. There were 49 recorded deaths aboard the Queen Mary but there have been many more spirits recorded on the ship. Due to security reasons, records were not kept well during the war and many deaths occurred due to the extreme heat the soldiers had to endure. A great number of soldiers also jumped ship in New York. There was no way to tell how many survived and made it to shore. Since the ship has been permanently docked there has been at least 1 suicide, a woman jumped over the railing to her death. Screams can be heard coming from the kitchen area, with good cause. It has been said that there was a cook who angered the soldiers so badly during WWII for making terrible meals that they cooked him to death in his own oven. John Pedder, nicknamed, “Half Hatch Harry,” is one of the most famous ghosts on the ship. This young man was an 18-year-old fireman who was crushed by door #13 during a drill in 1966. There are several of scenarios speculated to why he would have been crushed by the door that took a full 60 seconds to close, but none of the theories can be backed by documented proof. He is said to still be roaming the ship and is recognizable by his 1960’s crewman attire. He is very popular with visitors as a great number of people have reported an encounter with him. They have even reported to have found grease in hand print form from unseen hands and to have had their clothing or purses tugged on. Poor Dana. She and her entire family were murdered by her father. Her two sisters and mother were found in room B-474, strangled on the beds and Dana and her father died of gun shot wounds in the bathroom. Dana likes to play in the archives and cargo area. She has also been said to have been found possibly near the second class pool, calling for her mother. A staff member was murdered in this room and they no longer rent it out to guests. The activity became too disturbing to guests so they leave the ghost of the victim alone. Before closing off the room, things would fly across the room, sheets were thrown off the bed and faucets would turn on an off by themselves. John Henry once worked in the boiler room. His remains were found just outside this area. His apparition has been seen in the boiler and green room area. The boiler area is also frequented by “Grumpy,” Dana and another spirit, Cary. The pool areas seem to be a great place for the spirits to converge. They hold a great deal of activity. May spirits like to frolic, play and cause a great deal of commotion in these areas. If you visit, keep your senses alert for an encounter with the following spirits there, Jackie, Sarah, a woman in a bathing suit, “Grumpy,” Jeremy, Jack and Terrance. Jacqueline Torin, “Jackie” was about 5 or 6 when she drowned in the second class pool, which is now the site of the Royal Theater. She haunts that area and the first class pool area. She is a very playful and strong spirit. She calls for both of her parents, sings, dances and even answers questions audibly. She has a friend with her who protects her. Her name is Sarah and she is a little older, about 6-8. Sarah drowned in the pool as well in the year 1949. She is a little more aggressive in spirit. A young boy called Jeremy has been heard by one of the paranormal investigators, playing with Jackie. He can be heard giggling, laughing and speaking. A woman in a bathing suit also frequents the pool area on both the upper and lower decks. She looks to be in her late 20’s or early 30’s and wears a bathing suit consistent with the 1930’s time period. Perhaps it is her who is leaving phantom wet footprints and unexplainable puddles on the pool deck. There is an angry spirit lurking in this area as well. He has been heard growling at people. His real identity is unknown. He also wanders to the boiler room and the halls leading to the pool area. He was nicknamed, “Grumpy,” by one of the paranormal investigators. Jack and Terrance are usually together in the 1st class pool area. They like to tug on clothing and have been heard saying their names. These two WWII soldiers may stick together because they may have passed together. David and Sarah are looking for their children and have made contact with one investigator by the name of Robert Wlodarski through a seance. They will answer questions if addressed by name and usually travel together. The author of “Queen Mary Shadows,” where I found a great portion of the information on the spirits who haunt the Queen Mary, states that her and her daughter both, at the same time, saw a man they call, ” Fedora Dude.” He was seen in the lobby area and took off down a hallway. He was a very tall, creepy man with yellow teeth, wearing what she describes as a “zoot suit” and yellow Fedora. You may also have an encounter with the Lady in the white evening gown here. The Queen’s Salon is also frequented by the lady in a white evening gown, who has been seen dancing to music that cannot be detected by the human ear. She also heads over to the main lobby to be closer to the piano. One of the ships officers, William E. Stark, was an entertainer. He was waiting for other officers to arrive and decided to have a drink. There was no Gin in the Gin bottle he grabbed. It was actually filled with cleaning fluid. Stark did not realize its contents until it was much too late. He became very ill over the 4 days that followed and died on the ship. He frequents the Captain’s cabin on the main deck as well as the Promenade. If you happen to hear choking noises whilst aboard, only to turn and no one is there, you would not be alone. Daniel is about 5 or 6 and he too has been seen in the Promenade area looking for his parents. He is a wanderer though and has also been seen near the stairway near the shops, and observation bar. He is dressed in blue Edwardian clothing and has been nicknamed, “The Blue Boy,” because of it. “The Dude,” has been nicknamed as such because of the way he looks. He is impeccably dressed in this top hat and tails and has his hair slicked back. He is known for sneaking up behind unsuspecting patrons in Sir Winston’s bar area. He clears his throat while standing behind the living to get their attention. Once he has accomplished this, he disappears through a wall into the men’s room. This area is still home to very old toys and trinkets. Children can be heard crying and playing here as if they never aged. On October 2, 1942 the Queen Mary was doing an evasive measure, zig-zagging in front of the HMS Curacoa, colliding and butter her in half. The ship sank in 6 minutes killing all 300 crew members. This damaged the bow of the Queen Mary where screams, rushing water and sounds of ripping metal can be heard. It is uncertain if any of the 300 who drowned in this disaster have boarded the Queen Mary in spirit. 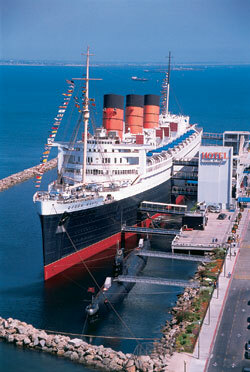 There is a great deal of evidence online to support the fact that the Queen Mary is haunted. Once you board the ship, your fully charged phone or camcorders may drain, orbs may taunt you by dancing in front of you, and you may come across any of the above spirits listed or many others. In the video below (Source #2), you will notice that a tour guide, interviewer and camera person walked in on an entity communicating by turning a light off and on. In another YouTube video (Source #1), a mother and daughters are staying in a newly refurbished room on the ship that had not been occupied in many years. They capture several orbs on tape as well as mysterious phone activity and draining batteries. Ghost Encounters (Source #3) captured some strange, loud noises on camera. Noises that one employee from the ship states she has never heard before and she is quite familiar with all the sounds in that area of the ship. They also caught an intelligent response, possibly from “Jackie,” when they proclaimed they had to leave. For additional videos and resource information, paste the URLs below in a new tab. If you are thinking of heading there for a one-of-a-kind ghost encounter of your own, you can take one of the many tours they offer, including, The Ghosts and Legend Tour, a Haunted Encounters Tour or a Self Guided Tour. If that doesn’t sound quite what you are looking for, you can choose one of the night tours, all geared toward seeking the existence of the paranormal. There is even one tour that lends you tools of the trade to assist you in capturing your own ghostly evidence. For more information on all the tours they offer, you can check out their website, http://www.QueenMary.com. In all fairness, expect an extra guest or two to join you on your tour group! Learn more about other haunted locations and read about my own ghostly adventures and experiences by checking out the side bar. Thank you as always for stopping by. Don’t forget to follow this blog and like my Facebook page, Where The Ghosts Live – The Haunted United States, for more. I understand, you want to read what was most popular. What were the top choices of readers for the month of October 2013? I’d be happy to share those with you. Today will end the 30 (31) Day Ultimate Blog Challenge for this quarter. As I prepared this blog site for launch the end of September 2013, I had no idea that it would be as popular as it got. I am grateful to everyone who viewed, shared and followed it this month. I will be continuing to create great new haunted posts but it will not be on a daily basis as it has been for the challenge. I will be working on my books for the month of November but I will stop in and be sure to provide you with entertainment on both blogs. I hope if you have enjoyed it that you will follow it as well as it’s Facebook page, https://www.facebook.com/WhereTheGhostsLive to keep up with the new haunts. I hope you have enjoyed one or more of these articles. Please be sure to leave a comment so I know you stopped by. As always, I appreciate your visits. The Slater Mill is an old textile factory built in 1793 in Pawtucket, RI and was the first water powered cotton mill. It is a historical landmark and museum which showcases the machines of the American Industrial Revolution. If you were to visit this museum, you would find that it offers, exhibits, a research library, theater, gift shop, demonstrations, lectures and more. This location can be rented out for an array of different types of events. There is a great deal of energy in this mill and it doesn’t all come from the machinery and water wheel. This mill is haunted. Slater Mill employed entire families during the 1800’s. It was not uncommon that a child of 6 or 7 might be found in employment. These were different times. One of the machines on display at this location was the cause of many dismemberments and deaths. When the machine jammed, they would send the small children in to fix it because they were much smaller and could quickly and more effectively escape when it started to work suddenly. There have been several sightings of black figures, children have been heard screaming in pain and many other instances of paranormal activity has been felt here. This location offers ghost tours at all 3 of the mills on site. Join the Johnson twins, Carl and Keith from New England Anomolies Research and Investigation Team as they guide you on a real paranormal investigation. For times and dates, check out the website, http://www.slatermill.org/programs/ghosttours. The Myrtles Plantation on U.S. Highway 61 in the southern town of St. Francisville, LA has such a sordid past. It’s no wonder it has been dubbed the most haunted bed and breakfast in the country. The mansion was built in 1796 by General David Bradford, the infamous leader of the Whiskey Rebellion, then passed to his daughter after he passed away. His daughter lived there with the Judge, Clark Woodruff and their children. The Judge turned to one of the slaves, Chloe and made her his mistress. She spent a great deal of time in the house caring for the children. She seemed to want more that just a mistress title and tried to gain leverage by listening in on the conversations of Judge Woodruff and his guests. After several warnings, he caught her eavesdropping one evening on private conversations with very important guests. To teach her a lesson, he ordered to have her left ear cut off and banished her from working in the home. Chloe was distraught as the banishment and wanted to be able to work in the home again. She devised a plan in which she would served the family a poisoned cake, they would become very ill and she would administer herbs to heal them, leaving her the hero. The dose of poison she used was too high and it ended up killing the judges wife and two of the children. After she confessed to her crime, he sentenced her to be hung for it. She was then weighed down and tossed in the Mississippi River. There have been several reports of the family, who still takes up residence in the home, being seen and hear. Perhaps they appear because they are unsure of why there are so many strangers in their house on a daily/nightly basis. On any given day, at any given moment, you may be startled to see rocking chairs rock on their own, hand prints on the mirror that will not come off, the piano playing on its own, glasses shoot from the ceiling from above the bar from where they hang, or feel a tug from the children as they try to get your attention. You may also see Chloe wandering the 5000 foot old brick courtyard or hear reports of furniture being found to have been moved after the place had been locked up tight the night before. If you take the tour, by sure to hold on to your earrings. Many have gone missing in the parlor area and others found in the most bizarre of places by the staff. Perhaps it is Chloe. Only one will go missing, and really, that is all she needs. You may even see her in the picture above from the Plantation’s History page where they believe you can see her haunting the courtyard. If you dare to tour, but are not sure if you could handle the ghostly appearances that haunt the home as you sleep, they do offer day tours between 9 and 5 daily. The home is beautifully adorned with southern antique artifacts. It is a beautiful mansion, sitting on a lush 10 acres of land adorned with beautiful oak trees. If you are feeling more adventurous, mystery tours are conducted on Friday and Saturday evenings. Weddings are held on site and can be booked through their main page, located below in the source info. Take a lot of pictures. You may find some wedding crashers when your film is developed. Last night was amazing! What better thing to do on a creepy October night with a full moon and an eclipse than to visit a haunted mansion? My husband and I were accompanied by one of my best friends and two of her children while we visited a certified haunted location last night. I have written a great deal about the S.K. Pierce Haunted Victorian Mansion on this blog site and I have been pulled toward the location many times. Tonight was my first look inside. I must say that the Spirit Sleepers Paranormal Investigators Psychic Faire was a life-changing event in so many ways, to say the least. I don’t want to share too much in this post, instead just give you an overview of what you can expect to see here over the next week on this blog site. I hope to return tomorrow night to the Victorian. They are hosting a Flash Light Tour fundraising event for The Relay For Life and I’d like to support it. That’s the only reason I am not posting yet about my experiences. I am sure I will have more tomorrow if I go and I want to wait to post it all together. A walk through of the experiences of the paranormal activity my group and I had during the tour of the Haunted Victorian. A few pictures of the inside of the Victorian. The furniture and woodworking in the house are incredible. YES! I think I captured a spirit when taking a picture of a mirror in the dark. I will share it for your opinion. My life-altering, first ever Tarot reading by a sweet, lovely and talented Witch from Salem. (This you won’t want to miss. I caught the entire session on audio tape so I can review and report it accurately, which I have not listened to yet. And yes, I’m an open book so I don’t mind sharing.) Some of the subjects she touched on that I will share are, “My Purpose,” “The Several Reasons For My Paranormal Experiences Since I was 13,” “A Few Things About My Children,” “How this information affected me” and a few other topics. Info about my palm reading that I recorded. Results from my husband’s first ever Tarot reading, also caught on tape, including information on “Upcoming Winter Weather,” “Finances,” “His Special Gift,” “The Light of His Life,” “Work Issues,” “A Prediction” and many other things. None of us left the mansion without an experience. I can’t wait to share it all! Follow this blog if you’d like to hear more. If you would like to visit the mansion tomorrow night on 4 West Broadway on Gardner and bring your flashlight between 4-8 for a $10 tour. All proceeds go to the American Cancer Society. Thank you for stopping by today! Also check out my other blog, The Peace And Happiness Project ~ Missy Bell. F . (Feelan) O. Stanley and his twin brother, Francis sold their photo plate business to Eastman Kodak to venture into the auto industry. The inventors of the Stanley Steamer Automobile produced their first car in 1897. They were the first to drive a car to the top of the 7.6 mile Mt. Washington in New Hampshire. They sold this design and formed the Stanley Motor Carriage Company in 1902. Freelan suffered from TB which prompted his moved from New England to Colorado where he built his pride and joy, The Stanley Hotel, deep in the Rocky Mountains off Steamer Drive in Estes Park, Colorado in 1909, 9 years before selling off his automobile company. He was also responsible for establishing the Rocky Mountain National Park, Estes Park Fairgrounds and Stanley Park. He perished of a heart attack in 1940 and is buried at a family plot in Newton, Massachusetts. It is said that you can find him roaming the halls and the lobby of the hotel, making sure that everything is running properly and spending time with his wife. One year prior to F.O.’s death, his wife, Flora had a stroke in the lobby of the hotel. Having been a very accomplished piano player, it is said that she will still have a seat there in the lobby area and play a piece on the piano for her guests. This reportedly started immediately after her death. The hotel had to be pretty creepy in order to inspire Stephen King’s, “The Shining” after his stay in room 217 in 1973. He had arrived just before the hotel was ready to close for the winter and, after roaming the halls and getting lost, he must have stumbled upon the ghosts of the children on the 4th floor who play in the halls. Jim Carey was at the hotel for the filming of, “Dumb and Dumber.” If you ever run into him, you should ask him why he packed his belongings and left the hotel without a word as to why, after spending only 2 short hours in room 217. Hundreds of ghosts who checked in to this hotel have apparently never checked out. The activity is so frequent that the main topic during breakfast each morning is “who experienced what the night before!” There has been reported activity from ever room and even from the employee access tunnel under the main building. Take a few minutes and view this video below from “The Most Terrifying Places,” to hear from the caretaker and get a quick feel of what the hotel looks like as he talks about the different paranormal guests who frequent this magnificent hotel. Elizabeth Wilson, a housekeeper at the hotel is said to haunt room 217. Many guests since the 1950’s have reported that they’ve received extra housekeeping in that room, such as their clothes being unpacked and put away. You can hear more of her story in the short tour video below. For those of you who would like a little tour of the place, press play for a guided tour with more fascinating information. If you are short on witnesses for your marriage, you can get married here and I’m sure one of the ghosts will stand up for you. I even checked the packages for you. The Stanley Hotel offers a “Ghost Adventure Package,” which includes “a guaranteed 4th floor room, a K-2 meter per reservation, a glow in the dark Stanley Hotel squishy ghost per person, and one REDRUM mug per person.” Save yourself some money and book 30 days in advance for 20% off your booking cost. I was very excited to see that they have a “ghost laundromat! !” That is, until I put my glasses on. Sorry. It’s just a “guest laundromat.” I was going to book just so one of the ghosts would do my laundry! Stay if you will, but remember, you may check in alone, but at this hotel, you are NEVER alone!! If you have enjoyed this post, follow me on Facebook at Where The Ghosts Live – The Haunted United States. You can also read posts of other haunted locations by checking out the categories section in the side bar to the left. I have another blog site that is geared toward helping people reduce stress and increase peace and happiness in your life. I hope you will visit me there as well at The Peace and Happiness Project ~ Missy Bell. The Lincoln Theater in Decatur, IL, opened October 27, 1916, built atop ancient burial grounds and the ashes of two hotels that once stood on it’s very location. This is an amazingly beautiful theater with its high balcony, basements and sub-cellars, private seating boxes, mezzanine seating, ivory colored columns, 1346 seats and amazing acoustics. Upon it’s opening, the theater was most used for stage shows and vaudeville acts as well as high school graduations. Many famous people performed upon its stage such as, Bob Hope, Fighter Jack Dempsey, Magician Harry Blackstone Jr. and some may argue that Harry Houdini may have even put on a show there early in his career. When motion pictures became popular, the audience demanded to see more, leading to a large decrease in stage shows. The theater closed shortly after December of 1980, except for a few live music shows on occasion. The theater was abandoned by 1990 and was not in use for quite some time. It has since undergone quite an extensive restoration project that has not stopped performers from putting on a show or two. It has been reported by many to have experienced ongoing paranormal and unexplained activity in the theater during these events. In 1860, the site was first the home of The Priest Hotel which was bought out in 1880 and the name was changed to the New Deming. Later in 1892 it changed hands again and was renamed The Decatur & Arcade Hotel. The building caught fire in 1904 and was rebuilt only to later, in 1915 catch fire again (see photo left) due to some oily rags near a furnace, this time, taking 2 lives that have been documented but several other guests were unaccounted for. It is unsure if they escaped the fire as their bodies were never recovered. Of the two men who were recovered, one, William E. Graham was an engineer and the other, C. S. Guild, a traveling salesman. Troy Taylor, author of “Haunted Decatur,” on his web page listed below, talks about how there have been reports of haunts at this location since the 1930’s. One legend has it that the most reported to be a stagehand named, “Red,” who’s love of the theater and performers may have him coming back to haunt the place. One night, while working on the catwalk, some 75 feet above the stage, it is said that Red lost his footing and fell to his death. However, after investigation, Troy states this story is inaccurate. According to his sources, Red died in his sleep while taking a nap in the theater in 1927. Since Red’s death, there have been reports of unexplained footsteps, whispers, strange voices, cold chills in certain areas, having been touched by someone who is not there, apparitions, theater seats raising and lowering on their own and other noises in the otherwise empty theater. A second figure, that of a woman in a long dress has been seen in the balcony area. Yet, others have reported to have described what they have seen and they do not match either description, leading some to believe there are several occupants. Troy states he has had experiences himself while working alone in the theater. He has heard footsteps climbing the steps of the stage while he was alone. He tells also of a performer who heard whispers while he was getting ready to go on stage and when he turned toward them, he saw a shadowy figure on the spiral staircase that he described as being male. When the staff checked into it, there was no one there, yet there was nowhere the “man” could have escaped to. At the time, the performer had not known of the haunted reputation of the theater. This was the same staircase that Troy reports being followed on by one of the ghosts. There are haunted tours of Decatur taking place this month, most of which are sold out. There are however, two dates that have availability. The tours are inexpensive at $30 per person. They start at the Avon theater. The 2 open dates are November 1st and 2nd (2013.) According to the website, Haunted Decatur, public tours are also offered April through August and mid September through early November. Private tours are also available. Please check the above link for prices and details. The Lincoln Theater – The History and Mystery of Decatur’s “Most Haunted” ~ By Troy Taylor – What a great website with such detailed history of this location! “The Lincoln Theater (Most Terrifying Places in America) – Featuring Troy Taylor.